A desperate villager’s quest to become Zimbabwe’s newest executioner kicks off this intriguing debut horror novel involving man-eating plants, organ harvesting and other uncanny oddities. Abel Muranda is a devoted family man determined to do whatever it takes to feed his starving rural family, even if it means journeying far into the big city on foot in the hope of landing a job as the government’s hangman. Meanwhile, Zimbabwe’s ruling elite is in an uproar because someone has created a batch of carnivorous flame lilies capable of digging up the dead—and the government’s ghastly secrets, as the plants have been unearthing unmarked graves. Nothing is as it seems in Chiveneko’s science-fiction–tinged tale, which introduces readers to a lethal cast of bad guys and bad girls with tangled motivations. One intriguing subplot follows a man charged with creating a special gallows to be used for executions; he uses discarded weapons of war as his raw materials and would rather spend time cuddling up to his cold, metallic creation than to his warm, loving wife. At nearly 500 pages, this intricately woven novel is a disconcerting parable exploded to epic proportions. 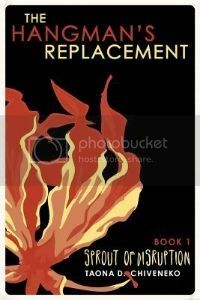 The author renders its many characters, from the mad genius responsible for the impending botanical apocalypse, to the prostitute/undercover operative who falls in love with Abel, to the seemingly simple Abel himself, with frightening subtlety and detail. One member of the elite, called Doll Eyes, is described as follows: “Planted into the lower part of his skull was a jaw of menacing proportions. If someone ever tied to mug him at gunpoint, all he had to do was clench it. This alone would demoralize the robber.” The boughs of this arboreal shocker threaten to creak under the weight of its ever-mounting plot, but they never quite crack. Instead, readers are left wondering just how deep the roots go. The outer reaches of a person's integrity can be measured by what they are willing to sacrifice for others. While some people have infinite frontiers of selflessness, there are those whose altruism extends no further than the most prominent hair on their bodies. When the interests of the latter group clash with those of the former, the result is the story that unfolds in The Hangman's Replacement series. The books are premised on the true story of Zimbabwe's recent efforts to hire a new hangman after the last one retired in 2004. The Sprout of Disruption (Book 1) starts with Abel Muranda; the aspiring executioner who needs the job to look after his starving family in the rural areas. Hovering above this simple man with a simple ambition is a group of murky characters with complex motivations. Their perverse rationale for emptying death row has nothing to do with the justice system. In fact, only injustice awaits those who fight to protect Abel Muranda from winning a job offered by people who believe that sacrificing others, including the aspiring hangman is necessary for their own salvation. The Sprout of Disruption introduces all the characters whose lives have been set alight by the carnivorous flame lily; the vine which sparked the frantic search for the hangman's replacement in the first place. The plant has been engineered to unearth secrets buried by people who would prefer to keep them hidden. Sometimes, the truth can be found six feet deep. But most of the time, it lies pretty close to surface. Either way, the sprout will find it. Each time it does, those who buried it will feel the Disruption. Book 1 is a collage of characters and events which plant the key pillars of the counter-disruption effort around, Abel Muranda. This is a very well written and insightful novel. Chiveneko’s style of storytelling gives you many outlooks on the same situation, each important and interesting in their own right. The author’s writing draws you in and makes it easy to relate to the characters, regardless of how difficult each character’s situation in life happens to be. She shows society and individuals at their best and worst in a very clear and captivating way. This novel is horribly frightening in its possibilities. I really like how the author smoothly works newspaper articles and letters into the story. It gives readers information that they may not readily have. It also adds a great deal of realism and clarity to the story. Chiveneko uses short sentences that flow well with and highlight the personality and plight of the main character. It really helps with both character and plot development while giving an added sense of urgency to the novel. The vast array of culturally correct characters is also very well developed beyond this. You get to know the characters as they get to know one another. An underlying theme of family above all else, regardless of personal consequence or sacrifice emerges through this.